In 1907, the first store in Seattle's Pike Place Market was opened. Reflecting on the heritage that inspired us, came this amazing blend with soft acidity, smooth body and subtle flavors of cocoa and toasted nuts. 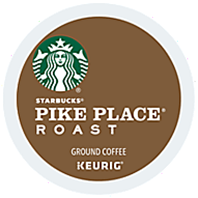 It's a satisfying cup that's rich in flavor yet balanced enough to enjoy every day. 96 Count $75.80 $73.80 On Special!